Today I received an email detailing the gross exploitation of the Samsung workers which I now share with you all. Help bring the hidden stories of Samsung’s supply chain workers to the Mobile World Congress, happening now in Barcelona. When airlines banned the use of Samsung’s Note 7 after its fire-prone batteries started to spontaneously combust, the public got a sense of the fear that Samsung supply chain workers face on a daily basis. Because beneath Samsung’s shiny exterior as global electronics giant is a corporate culture that is callously geared towards maximising profit to the detriment of the everyday lives of its workers. It’s a modern tech company with medieval labor practices, whose calling cards are union busting, poverty wages, and insecure and unsafe work conditions. This week Samsung’s modern face is on full display at the Mobile World Congress in Barcelona, where tech industry giants are gathering to unveil the latest in smartphones, tablets and mobile tech. Who’s not invited to the glitzy convention? The largely invisible workforce of 1.5 million low-paid supply chain workers from across the globe who make Samsung products under precarious and sometimes deadly conditions. Join with us to help bring the stories of Samsung’s hidden workers to Mobile World Congress and the attention of the world’s tech elite. Share now. It wouldn’t take much for Samsung treat their workers with dignity and pay a living wage. Our research shows Samsung makes $10,435 in profit for every supply chain worker -- meaning if they increased wages of $50 per month (just $600 per year) to reach a minimum living wage in Asia, they would still make $9,835 per worker. A tidy sum, even for a company so ruthlessly devoted to profit. For Hesty, who works in semiconductor production in Indonesia, a minimum wage on which she can live from Samsung would mean being able to pay for basics for her family such as clothes, food and childcare, without having to worry about whether her wages will last until the next pay day. Though Samsung would have to suffer very little to raise wages across its supply chain, its workers pay a huge price for the work they do: at least 79 workers have died of cancer related diseases after being exposed to chemicals used in the Samsung production process. And did the company take responsibility? Indeed not -- they refused to name the chemical that led to the deaths, citing trade secrets. It’s time Samsung and other tech giants acknowledged the true cost of modern tech by shedding their medieval practices. With all eyes on Samsung at the Mobile World Congress right now, your shares right now will have maximum impact. 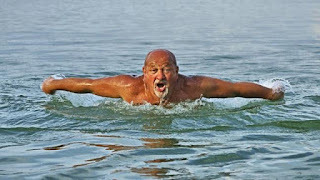 Splish’ splash’ splish’ Splash, Splash splish ! “By the toads tail! Where is that noise coming from ?” said Willy Walsh loudly as he woke from a deep sleep after consuming several jars of mountain dew. His sun tanned head lifted off his favourite oak apple pillow as he addressed his fellow imbiber, Tom Trippit, who was lying next to him on the bank of a slow flowing river. “But why now when I needs me shleep ? ” asked Willy. “Sure,’tis your own fault for complaining about him smelling like an old horse” replied Tom. “Yor memory ’tis failing ye Willy. Did ye not notice the Kisser woman he was with? An’ the gorse is in bloom, so ’tis all go now to kissing an’ that. Though I’d say his highness is well under her spell” said Tom. “By the Great Green Toad ! I never suspected that they were planting together” said Willy. “Aye’ tis bitten he is that’s for sure bathing in February” said Tom. “An I never copped it. So that’s why he was buying all them drinks, a’h thought it was odd for a Kerry man to be so free with his gold. Must be a strong spell she got him under” mused Willy. “Did ye notice how he lashed the drink into that old wan at corner of the bar, her what would drink off a scabby leg if it was free ? ” said Tom. Ah’did so! Was amazing how word got round so fast that he was treating. Why they came out of every hole in the ground, I’d say the cemetery was empty last night” replied Willy. “Begad! We was fortunate to have met the fiddler along the way otherwise we’d have missed out on a great night out” said Tom. The conversation ceased as each considered what had been said. Soon the sounds of long, loud snores rippled the waters, rattled the brambles and flattened the grass for miles around as Willy and Tom went back to sleep. is due to the authors lively imagination. 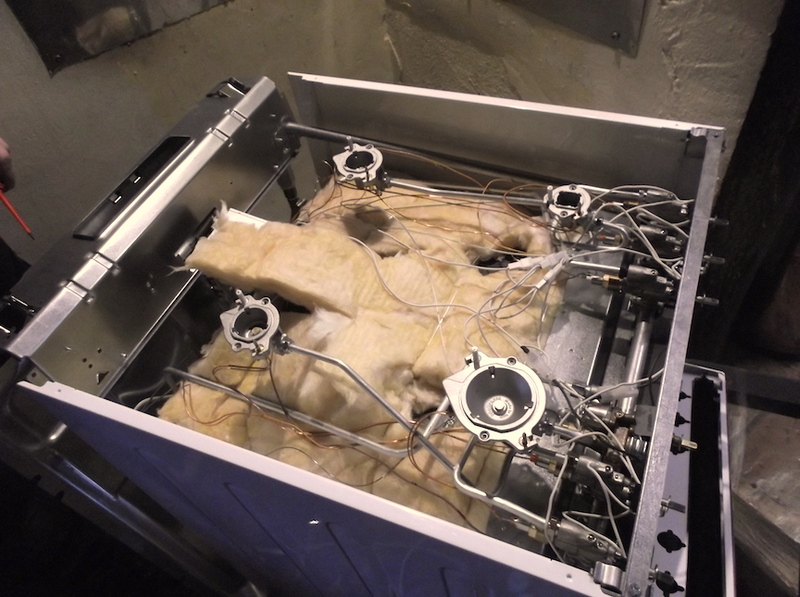 About month ago our twenty-three year old gas cooker finally gave up the ghost and died. It was no real surprise to us for the grill stopped working last year. We were not too bothered at the time because the oven and the top burners were still working efficiently. Sooner or later we would need a new cooker so we visited various retailers to find a good replacement. In the middle of January we made our choice. I particularly told the shop to ensure that the cooker was fitted with burner jets suitable for LPG bottled gas (Butane) which is used here in the countryside as there is no piped gas supply. I was informed that all of their cookers ran on ‘country gas’ and we arranged the delivery date. 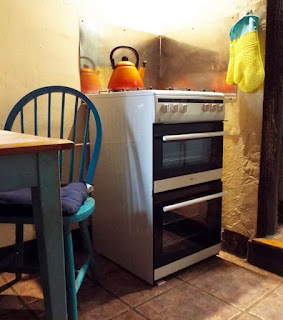 The new cooker arrived, the defunct cooker was taken away to be scrapped and all that remained was to make the connection to the gas bottle. I had done this a great many times in the past and it had not been an obstacle. I intended to do the same again, to the chagrin of the retailer, who said I needed a gas fitter to obtain a certificate. I competently made the connection without any leaks. 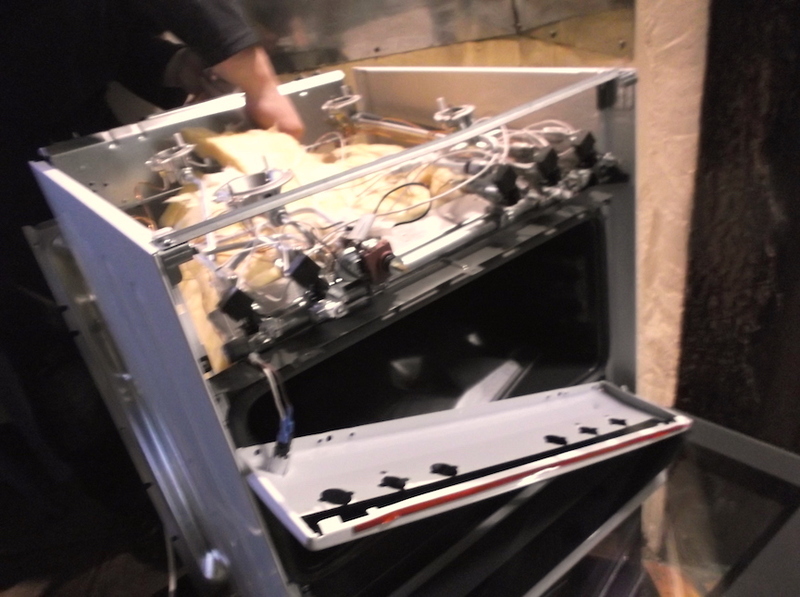 Next job was to the plug cooker into the electricity supply for the oven illumination and the six igniters. Then came the first test, igniting the rings. There were long yellow tips to the flames and the same phenomena also occurred in the oven. Very clearly there was a problem. The burner jets were for the piped natural gas which is supplied to cities and towns. Next morning I rang my supplier and informed him of my discovery. As I listened to his utter nonsense he tried to blind me with suggestions such as having fitted a bottle of ‘dirty gas’ which I totally refuted. Finally I was informed that the cooker had a kit with alternative burner jets, so I agreed to engage a Gas Fitter to replace them. The fitter arrived and then the real fun started. I don’t think he had ever changed burner jets before or even remove the various cooker parts, such as the top and front access panels. I ended up working alongside him, sometimes advising him on how to do his job. Re-assembly was even more humorous than taking it apart. We did achieve a sense of order eventually and used all of the screws that we had removed without having any left over. Then came the first test. Yes, the four top rings had blue coloured flames, as did the oven. We then ignited the grill. Damn and blast! The igniter worked, we could see it sparking. The gas was coming through, we could smell it. But no ignition, we had a banjaxed grill. Our gas fitter was with us for three and half hours, a job that should only have taken an hour. One week later (last week) a replacement stove arrived along with the Gas Fitter. More fun ensued, a lot more fun this time. There were gas leaks at the connection and he was mystified. 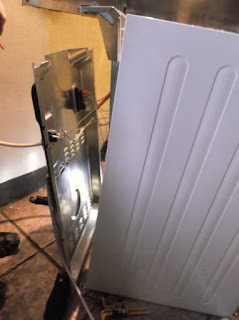 I explained that at the pipe connection union, where there was a fibre washer it had a tapered thread and that it did not need any PTFE tape. So he stripped off the tape and guess what ? No leakage of gas - Heron was right. I did though ask him for a certificate of worthiness and it is my belief that I had earned it! Galanthus nivalis, commonly called snowdrop, is a bulbous perennial which is native to Italy and southwestern Asia. By the mid-19th century snowdrops were being introduced into other countries, some being brought back from the Crimean War (1853-56). Here in Ireland the Altamonte Gardens in Carlow have almost certainly grown snowdrops since the 1850s and today they have over a hundred different varieties, some of which flower twice a year. Our first clump of common snowdrop appeared on the third week of January, early this year because of the mildish winter. They sit at the edge of a large shrub in the front garden and are well protected from the winds. 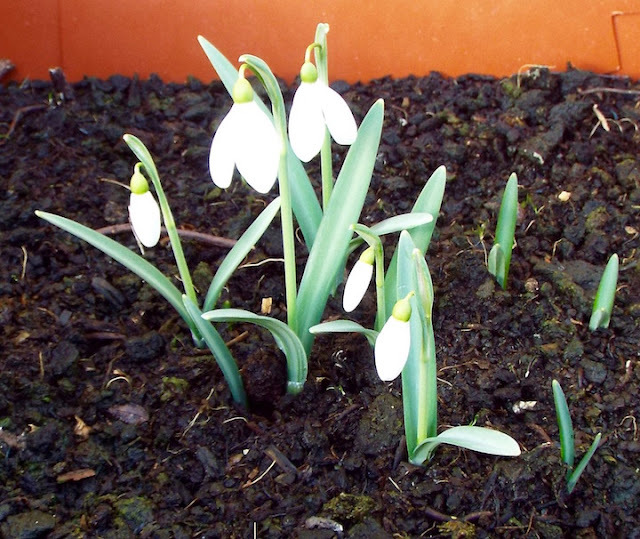 I have been keeping a watchful eye on a handful of some rather special scented Galanthus bulbs which came into flower ironically on February 1st, the First Day of Spring here in Ireland. These particular ones, Galanthus. S Arnott, have only been recently developed. They were a gift, sent to us by Mister Edd who is a Botanical Artist and friend of Mrs H. I potted them up by his request and today noticed a sweet scent from the flowers. Unfortunately my sense of smell is not keen enough to differentiate between perfumes but I have been informed they are perfumed like sweet honeysuckle. Mrs H will go out tomorrow with her superior nostrils! 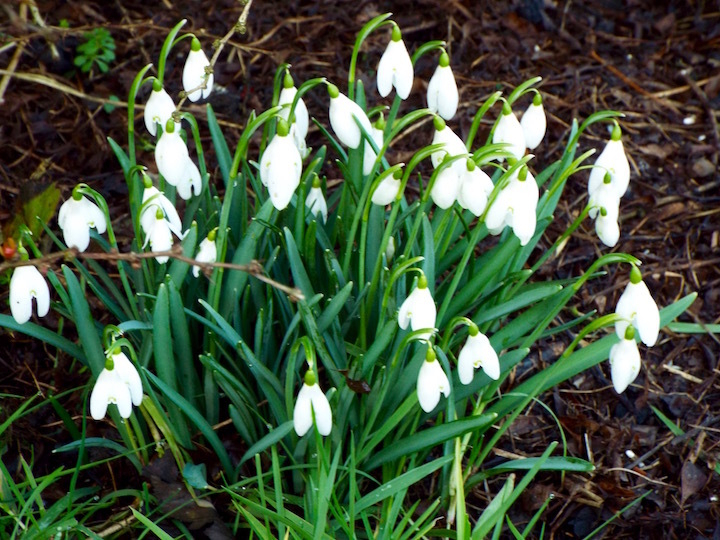 I must admit that since writing and researching for this blog post my knowledge of Snowdrops has dramatically increased, for I never ever suspected that were more than one sort.